An extraordinary offer! The amethyst is prized for its vibrant, violet color and its remarkable powers. It is thought to purify negative energy, heighten creativity, and provide calm, balance and peace. 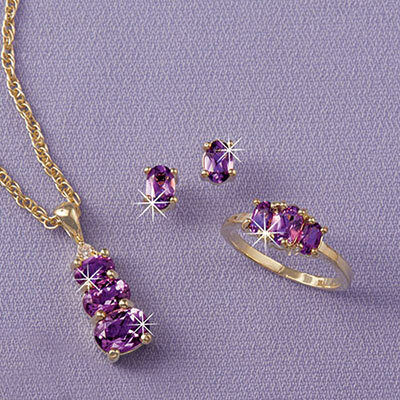 Our genuine amethyst jewelry set is elegantly crafted of sparkling, faceted oval stones set with a gleaming gold-tone finish. Set includes over four carats of amethysts. Necklace - ¾"l pendant with three graduated stones on an intricate 18"l chain; Earrings - ¼"l solitaire with post back; Ring - three stones, ½"w total. Specify size 6-10. The set is beautiful but it is not the bright purple color shown in the picture. It is more like a dull lilac color which disappointed me.